Cream Cheese Cranberry Dip ~ Cranberry Cream Cheese Dip Layered with Cream Cheese, Cranberries, Green Onion and Cilantro! Amazing Thanksgiving Appetizers! 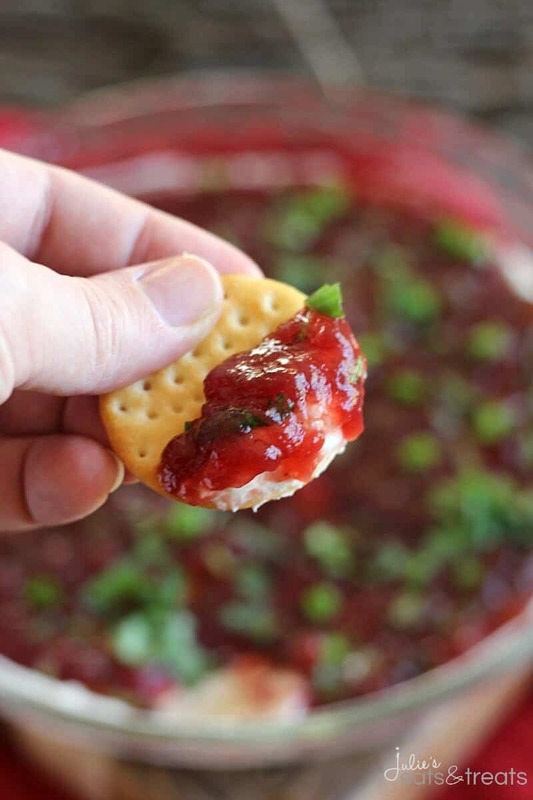 If you have a holiday party coming up this quick and easy appetizer is a must make option. The flavor combo of tart cranberries, sweet cream cheese and cilantro make your taste buds explode! Plus, it’s so easy to make that you’ll have it ready in no time at all. Well it’s on to the next holiday! Did you have a fun Halloween? It’s always fun to see the kiddos get dressed up and show off their costumes. Before we had Miss K I loved to hand out candy, but when we moved outside of town we didn’t get any trick-or-treaters so it’s a good thing we had a kiddo to replace the fun with! This year Miss K was Olaf and she had a blast. I’d have to say the hubs and I had just as much watching her! Now it’s onto Thanksgiving. Tis the season for holiday after holiday huh? Have you started to plan your Thanksgiving? It seems my family bi-passed the whole, Hey let’s figure out what we are doing for Thanksgiving… and moved onto here’s our Christmas plans! We keep getting invites to our family Christmas’s so it seems they are super on top of things there but we have yet to receive any information on Thanksgiving I really shouldn’t be worried about this as I’m due just a few days before Thanksgiving. I highly doubt I’ll be partaking in the festivities this year. If this baby is late then I’ll be stuffing my face with Make Ahead Turkey, Crock Pot Stuffing, The BEST Cranberry Sauce and Pecan Pie! So much goodness! It’s kind of a shame because I really like the holidays, especially Thanksgiving. It’s always fun to get together with family and celebrate what you are thankful for reflect on your blessings. I’m hoping I’m snuggling a sweet baby at Thanksgiving time and not 9+ months pregnant. I’m thinking, with my luck, it will probably be that latter option. I was overdue with Miss K and my mom keeps reminding me that her pregnancies each got longer! By the third she was 10 days overdue and threw in the towel. I don’t blame her for that decision! 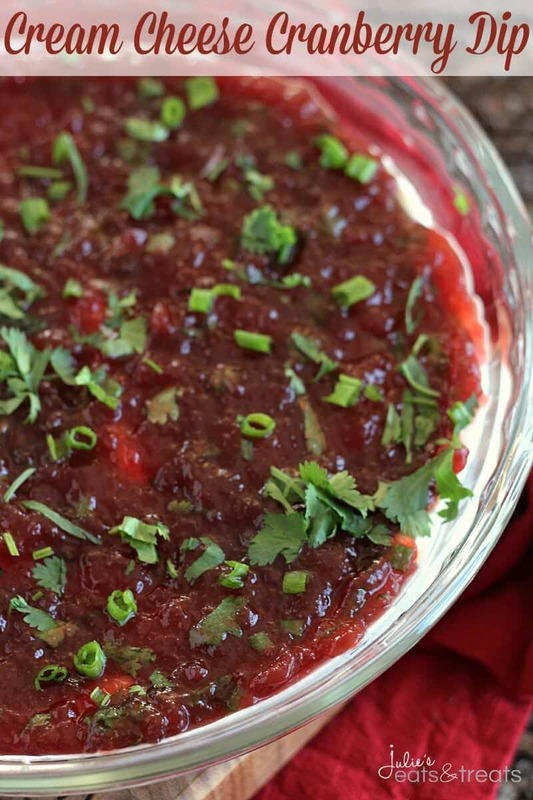 This delicious cranberry dip is perfect to treat your family and friends with this Thanksgiving. It will literally take you 15 minutes to whip up and have everyone ooohhhing and ahhhing over it. I’ll admit I was slightly doubtful of this cranberry cream cheese dip at first when my coworker brought it to a party, but I’m glad I gave it a shot and tried it. It’s packed with flavor and perfect for those holiday festivities because everyone is always grazing and munching on the appetizers! Only SIX Ingredients in Cranberry Cream Cheese Dip! Hand Mixer – If you don’t have a hand mixer…Buy.One.Now! You won’t regret it! Glass Pie Plate – Pie plates are so inexpensive and great for dips! Hot, Cold or whatever! Plus, you can always make a pie too! 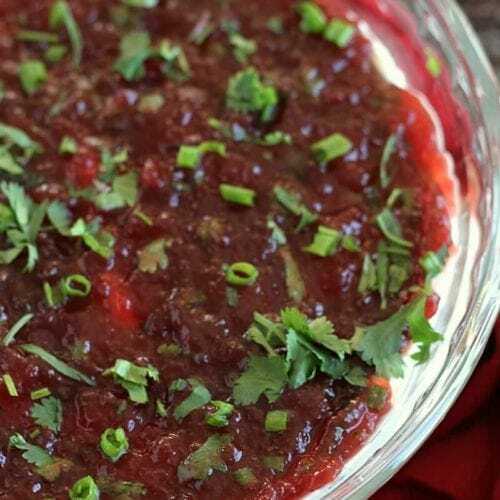 Cranberry Cream Cheese Dip Layered with Cream Cheese, Cranberries, Green Onion and Cilantro! Amazing Thanksgiving Appetizers! Spread cream cheese on bottom of pie plate. 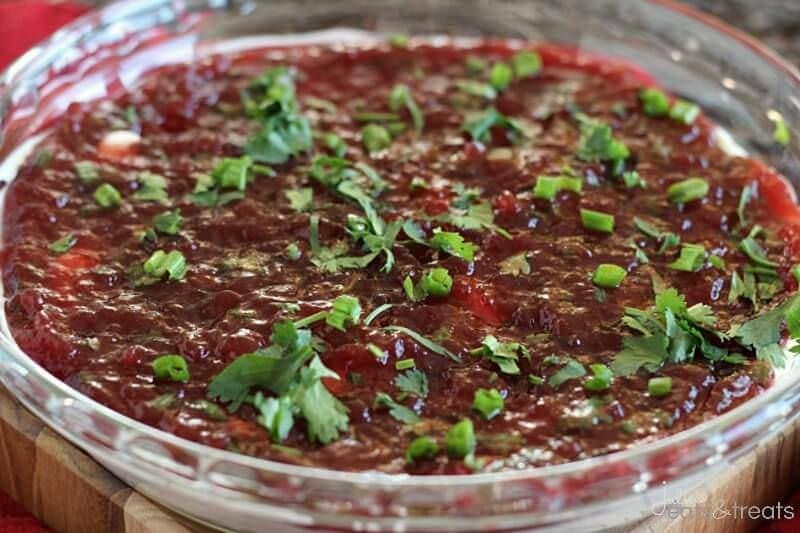 In a small mixing bowl beat together cranberry sauce, cilantro, green onion, cumin and lemon juice. Spread on top of cream cheese. I made it for Christmas, and it was a hit! Amazing dip, thanks for sharing! So glad you enjoyed it Priscilla! What would be an alternative to cilantro? Parsley?? I would just skip it! Otherwise yes you could use Parsley it’s just going to give it a different flavor! Can I make this ahead of time or is it better to eat right away? I wouldn’t make it more then 12-24 hours in advance. I just made this to take to a work Thanksgiving pitch-in. I am going to serve tortilla chips with it, instead of the crackers. I thought the cumin, lemon and cilantro make it like a southwestern/mexican appetizer and the torilla chips would be a nice addition. Sounds like a great thing to serve it with! I am going to try it with my homemade cranberry sauce. Looks great! Sounds like the perfect way to make it! I added some jalapeños finely chopped. Wow! Fantastic! Thank you!